Springtime - and a young man's fancy turns to thoughts of...asparagus? 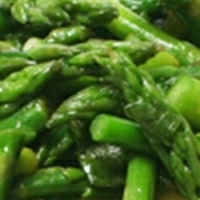 Asparagus salad with lemon soy sauce - it almost sounds like Spring! It seems that fresh, delicate asparagus defines Springtime like no other vegetable. It's the best time of the year for newly picked asparagus spears. Visit your local farmer's market or a grower to find the tastiest, freshest asparagus. They may have the typical green or the white variety - there is even a purple variety. All varieties come with health benefits such as folate, vitamin C and fiber. Many experts believe (including the AICR's experts, whose asparagus salad recipe we have adapted) that foods high in folate probably protect against pancreatic cancer. 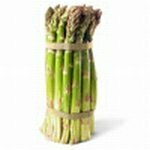 To get the best asparagus look for firm, smooth, bright green stalks with tight tips. You can refrigerate your asparagus for three to four days. The best way to keep it fresh is to store it upright in a tall glass. Put about an inch of water in the glass and loosely cover it with a plastic bag. Before you cook it, trim the spears and rinse the tips well. We think you'll enjoy this Asparagus Salad with Lemon-Soy Sauce. over boiling water until crisp-tender, about 5 minutes. seconds. Add broth, vinegar, soy sauce and sugar. dressing to a boil over medium-high heat for 30 seconds. Per serving: 97 calories, 4 g. total fat (less than 1 g.
saturated fat), 12 g. carbohydrate, 5 g. protein, 5 g.
dietary fiber, 134 mg. sodium.